Wrapping up Poetry Month with Stevie Smith! 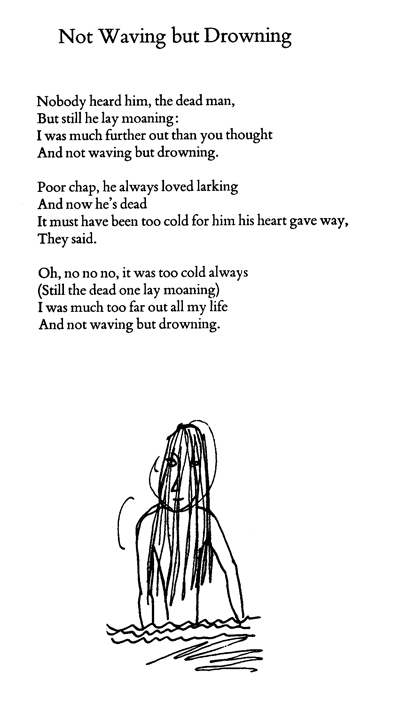 More recently I discovered that she also illustrated many of her poems. This completely added to the appeal, since stylistically she keeps it simple, which I enjoy. Sometimes a doodle says more than a grand work of art (and sometimes a doodle IS a grand work of art). This is not to besmirch grand works of art. Everything has its place. Anyway, while Not Waving but Drowning is her best known poem and it seems like I should go for a deep cut, sometimes you just have to play the hits. Here’s a scan of the poem (from The Collected Poems of Stevie Smith) with the illustration that was so dearly lacking from the version I first encountered.